NEED A HOTEL WITH FITNESS CENTER IN BARCELONA? Traveling doesn’t mean that you have to quit your usual training. Many hotels in Barcelona will make it easy for you to continue to stay fit during your vacation! They feature fitness rooms with machines, personal trainers, wellness zone and spas… where everything has been designed for you to spend a great time but also work hard taking advantage of with the latest machines and equipment. Some of them also feature a pool for those who like swimming, some other organize directed activities so you can join other travelers and practice together, some will suggest running itineraries, or give you personal assistance when using their machines and weights. You won’t miss your gym at home at all! In today’s post we share with you the local hotels with best gyms to continue practicing sport during your trip. The Fit zone of the W hotel is a 300 square meters gym, open 24h a day for hotel clients. It features some awesome gym equipment with audiovisual technology that will let you listen music or watch tv while you train. You are also offered the possibility of booking custom fitness programs – which is great if you are spending a few days in town. And you are also to welcome their classes: their pilates and yoga over water SUP tables (Stand Up Paddle) are the latest thing in our town! Or maybe you prefer running? No problem! The hotel has partnered with Nike to offer special running sessions to their guests. And after your daily practice: time to relax your muscles! Head to the Bliss Spa to recover from the effort. Located in Les Rambles, in the heart of Barcelona, this hotel offers a cool fitness zone where to relax and get in shape from 8 AM to 9 PM. 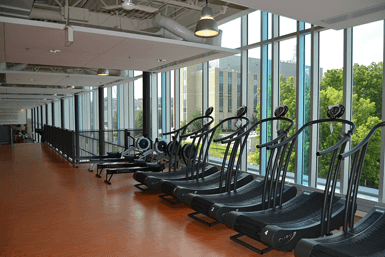 In their fitness room you’ll find stationary bikes, treadmills, steps, free weights and much more. There is also a spa with a cool indoor pool under the brick dome of what used to be the basement warehouse of the Tobacco Company that originally occupied the building, or if you prefer, the pool on the terrace of the 7th floor is acclimatized and can be used all year around, while enjoying the spectacular views over the Old Town (and Spring through Autumn, after bathing get a cocktail at the Isabella Bar next to it – closed in the winter months). A dream opportunity for pool lovers. Featuring a fantastically equipped gym and the possibility of hiring a personal trainer that adapts to your needs and can design a custom workout program for you. Or if you prefer, you can also book special Fitness packages that include an energetic but healthy and well balanced fitness breakfast, followed by a series of training activities such as running and working with a personal coach for two hours, then ending with an afterwork session at the luxurious hotel Spa where you’ll receive special relaxation treatments. Tennis, golf, skiing, soccer, marathon, sailing, windsurfing and surfing training are available on request. The gay hotel par excellence in the city features a wonderful fitness zone that includes all kind of state-of-the-art “precor” equipment. Let their fully licensed and very experienced personal trainers guide you while choosing the workout that is best for you. Or followed a their exclusive TotalCross33, a 45 minutes closed training circuit that will help you reaching your fitness goals. Nutritional assessment is also available on request. And of course, you can also access a very complete spa with even a waterfall, besides the usual features such as steam and dry sauna, hot tubs and lots of massages and rituals (individual or for couples). Although the gym is gay-orientated, hetero people are welcome too. This is one of the local luxury hotels with the best gyms: The fitness center of the Mandarin is open 24/7 and it’s equipped with the latest fitness equipment. Hire their personal trainer if you need help figuring out how to best organize your workout, or book a one-one-one yoga session, no matter what’s your skill level. At the Mandarin they pay lots of attention to detail, so don’t worry if you forgot to bring your headphones or if you need an extra towel: they can provide all of this – even complimentary drinks! There is also a nice indoor pool in a silent area that invites to relax and bathe. Also here, after your training you can head to their beautiful spa to receive a treatment to sooth your body: they even have private spa suites for couples – perfect if you train with your sweetheart and want to get rested together! (the private rooms not only have twin treatment beds, but also a private steam room and access to an exclusive jacuzzi, and you’ll be offered complimentary fruit and drinks as well). AND BONUS! 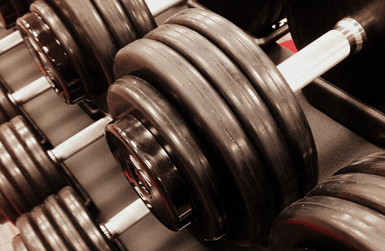 Want to know what hotel with gym has the largest fitness center in town? Probably one of the best hotel fitness centers in town, the private Wellness Center of 700 square meters of surface is more than twice the second largest hotel gym in town! Equipped with the latest machines by the prestigious American Life Fitness brand, their cardio machines allow you to connect any kind of music or video device to a 17” screen – you can’t get bored anymore! Equipment conceived to cover any fitness need: muscle building, flexibility work, cardio training, stress management and posture correction. After your workout, head to their Spa zone and rest your body in the warm indoor pool where you can even receive an underwater massage or let the jacuzzi bubbles loosen your muscles. There is also an ice fountain, a sauna, a Turkish bath and a few sensation showers. So what about you? Head to the comments below and tells us: Is it important for you to choose a hotel with gym when you travel and why?